With all the health advice available at your fingertips on the internet today, it’s hard to know what’s actually important to the health of your teeth and gums. 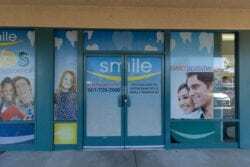 Smile Dental Group of East Palmdale, CA want you to know the top 10 dental care tips to help you keep your mouth and body healthy for years to come. You’ve been hearing this advice from your parents and your dentist since you were very small: brush your teeth twice a day. Brushing removes leftover food particles that combine with your saliva to form plaque, a clear sticky substance in which bacteria thrives. When left on the teeth this bacteria can cause cavities, tooth decay, and gum disease. You’re not fooling your hygienist and dentist. They know when you haven’t been flossing! Flossing is important because it clears away the plaque from the hard-to-reach places that brushing alone can’t reach such as between teeth. If plaque remains in these places, it can lead to gum disease, which is linked to cardiovascular issues, diabetes and even Alzheimer’s. Toothpastes should include fluoride because it helps strengthen your teeth’s enamel. Using a toothpaste with fluoride added can reverse early signs of tooth decay such as weakened spots in the enamel or exposed roots that could eventually become cavities. Sugar is a major contributor to tooth decay because it feeds the bacteria that live in our mouths. These bacteria feed off of the leftover food particles on the teeth, and if the food contains a high sugar content, bacteria can multiply even faster. Cutting down on sugar in your diet will help keep oral bacteria under control. Having routine dental exams with your dentist is essential to preserving your oral health. Your dentist can diagnose and treat early signs of tooth decay before they become severe, helping you avoid complex and expensive dental procedures. They will also perform X-rays to ensure the roots of your teeth are still solid and stable. A healthy diet is necessary not just for your overall health, but it’s important to the health of your teeth in ways you might not expect. In addition to good nutrition healthy foods provide your body, a lot of fruits and vegetables are crunchy and chewy, promoting saliva production. Chewy foods are good for the teeth because more saliva means the mouth is naturally cleansed more often. Keeping your body hydrated enables your mouth to produce more saliva, which helps keep teeth clean. Oral bacteria and leftover food particles are naturally washed out of the mouth by saliva. If you forget to brush your tongue, you may notice it has a white or yellow film on it, especially towards the back. When you brush your teeth, don’t forget to brush your tongue to remove foul-smelling bacteria that can cause bad breath. This may go without saying, but avoid biting down or chewing on hard candies or even non-food items like pen caps or fingernails. These are not meant to be chewed and can damage teeth. Your toothbrush doesn’t require special cleaning, but make sure it is clean ie no leftover toothpaste or food particles and dries after each use. Be sure to store it standing upright and exposed to air and your toothbrush will be good to go! 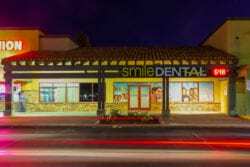 Smile Dental Group of East Palmdale, CA is here to help you maintain your oral health. Schedule an appointment online today or call (661) 463-6530 to help keep your smile healthy!